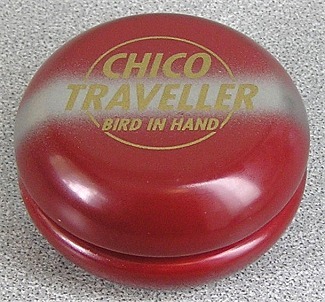 The Chico Traveller was the last yo-yo made by Bird in Hand, that carried their name and was not to commemorate their contests. Later Bird in Hand models were made for their National Contests, and made by companies like Hummingbird and BC. A very limited run of these and in a wide variety of colors, both for the yo-yo and the striping. Pictured here is a very striking Maroon Red Traveller, with Silver Stripe and Gold logo. Gorgeous! Special Thanks to Bob Malowney.